EPC Group was established in 1999. The main mission of EPC group is to assist our clients to complete their projects within the given timeframe, with regard to the agreed budget and complying to all major safety regulations. Our main objective is to help our clients to make a reliable assessment of their complete project scope and reduce risks and optimize results. We work with the entire value stream in conjunction with individual departments inside your company. Using this approach we can develop improvements in close cooperation, meeting but many times exceeding your expectations. Using the knowledge of the class A staff at the EPC Group, the quality of the work and the on-time delivery as per gated work process can be guaranteed. 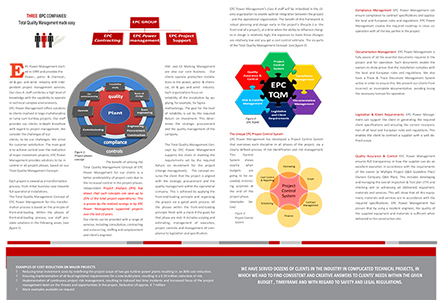 EPC Power Management has developed a Project Control System that overviews each discipline in all phases of the project, via a clearly defined process of risk identification and risk management. All work within EPC Group is executed using the unique Project Control System. 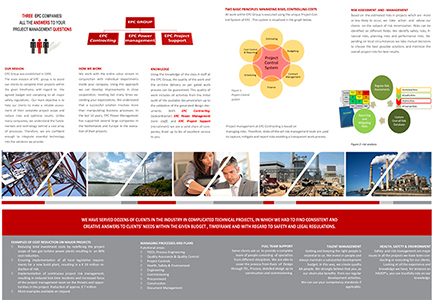 All information regarding the EPC Group is provided in the two brochures shown below.